If you are unavoidably late, and the warm-ups are still in progress, quickly stand at the edge of the mats and WAIT until you are noticed and acknowledged before joining the warm-ups. If the class is already in session, perform a warm-up of your own off the mats, then follow the steps above. 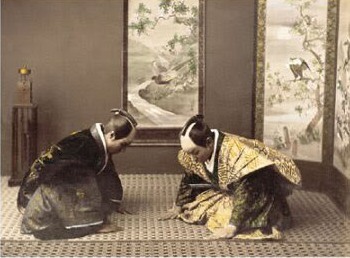 The proper way to sit during class is in seiza, the formal Japanese sitting posture. A cross-legged sitting position isacceptable if seiza becomes too uncomfortable. In any case, an attentive posture should be maintained at all times. Students should not slouch, lean against walls or sit with legs outstretched. For reasons of safety, respect and courtesy, it is essential that the teacher's instructions be followed exactly. Many Bu-Jutsu (Yeshua-Do) techniques can be dangerous if not practice properly. Be sensitive to the physical limitations and experience level of your partner and never perform any exercise which you feel is too dangerous for your current physical or technical ability. In Bu-Jutsu (Yeshua-Do), like in other traditional martial arts, learning with the eyes and body is emphasized. Help each other by following the technique with the appropriate body movements rather than with words. If it is necessary to speak, do so in a low voice. Cleanliness is a reflection of your attitude toward Bu-Jutsu (Yeshua-Do), your teacher and your fellow practitioners. Please keep your fingernails and toenails clean and short. Keep your uniform clean and wash it regularly. If you become unable to continue practice, let your partner know. INFORM THE SENSEI before leaving the mats. If you just need a short rest, move to the edge of the mats and sit quietly watching until you are ready to resume practice. If you have medical condition or previous injury that may affect your practice, notify the Sensei ofthis before class starts.